The meteorological (Met) department has forecast more rains through the day and relative humidity at 100 per cent in Delhi. Heavy rains lashed several parts of Delhi-NCR through the night with waterlogging disrupting road traffic movement at many places in the national capital and Gurgaon. Rush hour traffic was thrown out of gear in Haryana’s Gurgaon and normal life was left paralysed as morning commuters got stuck in traffic snarls, including an over five-kilometer jam on a road between Hero Honda Chowk and Khirki Daula Toll Plaza. Twitter was soon flooded with pictures of waterlogging and jams. Officials said vehicular movement was also affected at IIFCO Chowk, Signature Tower, Mahavir Chowk, Rajeev Chowk, Sikanderpur, Old Gurgaon, Huda City Centre and Sohna road in the city. “Light rains started at around 2 a.m., but it gained momentum by 4 a.m. and between 6 to 8 a.m., it turned into heavy downpour,” A.R.S. Sangwan, Deputy Director National Capital Region told IANS. Office-goers in Delhi, too, faced a lot of inconvenience due to traffic disruptions with most opting to use the Delhi Metro rail’s services, which were delayed due to over-crowding. “There will be a generally cloudy sky during the day with moderate rainfall and thundershower likely to occur,” an India Meteorological Department (IMD) official said. 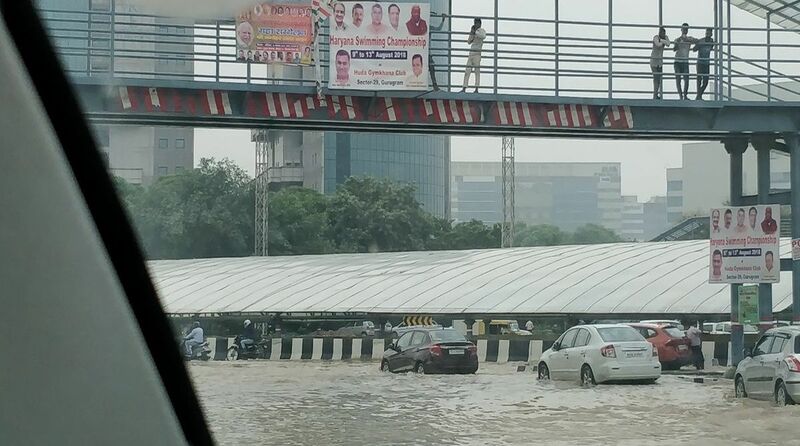 Heavy rains were recorded in central and eastern parts of Delhi with waterlogging and traffic congestion being reported from areas such as Mayur Vihar, Palam, Dhaula Kuan, Bhairon Enclave in Punjabi Bagh, Moti Nagar flyover and between Mundka and Rajdhani Park. Teams of the traffic police are on the ground and efforts are on to decongest roads, he said, adding that vehicular movement on major roads was affected due to waterlogging. The maximum temperature is likely to hover around 32.7 degrees Celsius.